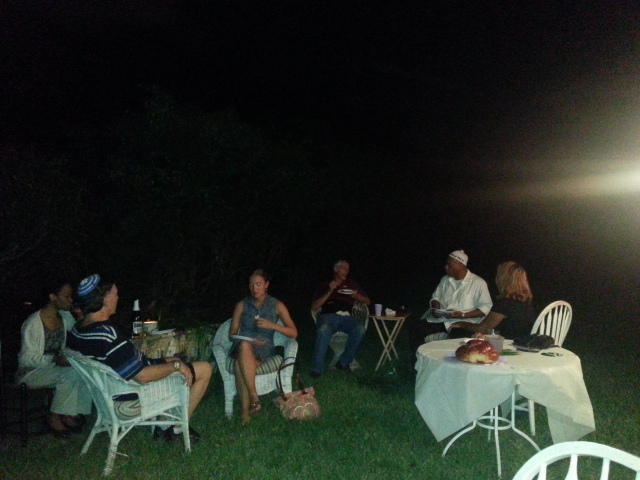 Sharing the joy of dwelling in a sukkah is made sweet with the fellowship of mishpocha – family! Saturday and Sunday evening, we had lots of fellowship with the family of God. 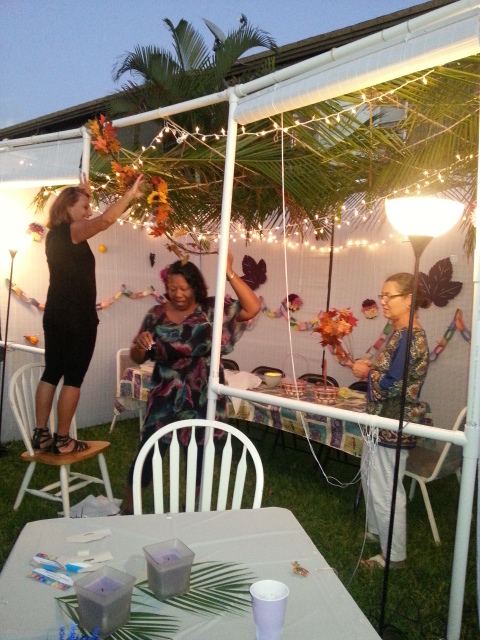 Everyone came with a decoration in hand to add their own special touch to the sukkah. After all, it is a family sukkah! With each person’s special touch added, we gathered for a great meal. 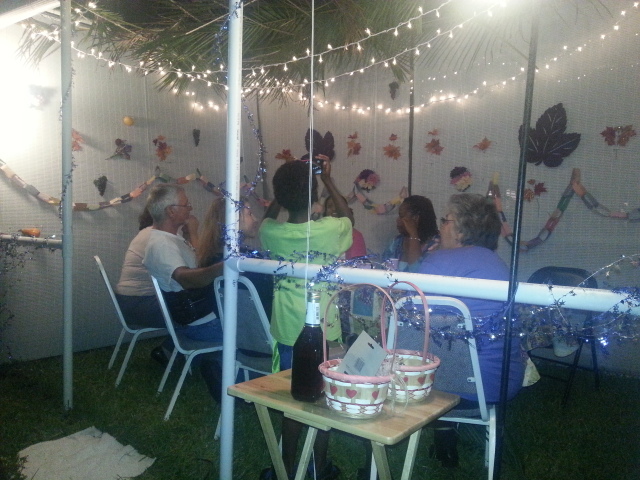 Everyone took turns dwelling in the sukkah as laughter and good conversation went on until late in the night. Look at this beautiful sukkah. All the precious decorations and all the precious people. Ready for round two on Sunday night, the sukkah is patiently awaiting the arrival of our Torah study group. We are gathering to celebrate the season and to get reacquainted. The group ended our studies mid summer and have been missing each other a lot! A lot a lot! 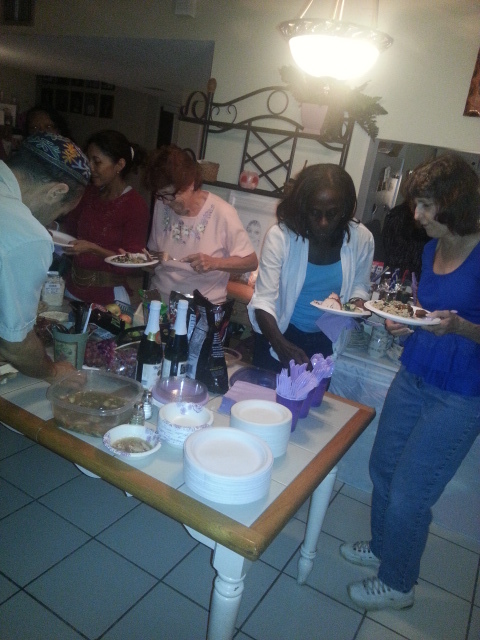 It is so amazing how the Torah of God draws believers together. As I’ve mentioned before, this was the first year I built a sukkah and spent the week celebrating – either with friends and family or just me and the Lord. What struck me as so amazing, is that no matter with people, or without, the very air seemed filled with joy. It is such a special time. As I sit this evening in the sukkah, hearing the echos of laughter that have filled this place, I think about the birth of our Messiah and the joy that fills our heart at the thought of what He did for us. Did you know that it is likely He was born during the festival of Sukkot? The thought of it adds even more joy, if that’s possible. If you have never celebrated Sukkot, let me suggest you plan to do so next year. Even if you can’t build your own sukkah, be sure to join someone who has one. And if you happen to be in the neighborhood, be sure to give me a shout. I’d love to have you over for a very special time of joyful fellowship! Rosemarie let me tell you that your journey that you’re on really blessed my heart. I could just see the Lord through your words and hear the very excitement of your celebrating Sukkot. It just made me cry because your joy in our Savior is so contagious, and heart felt. Thanks for sharing your adventure, and fellowship. Dave, you are most welcome. And thank you for sharing your thoughts. You have blessed my heart knowing that our Abba’s joy is spreading. 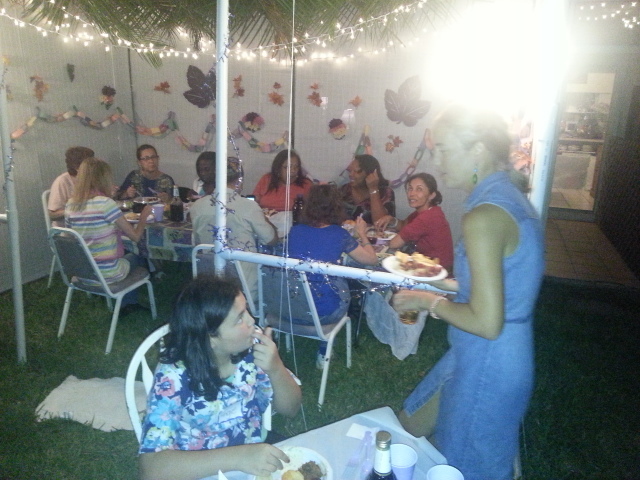 Well, I see you and your guests enjoyed very much your Sukkah!!! 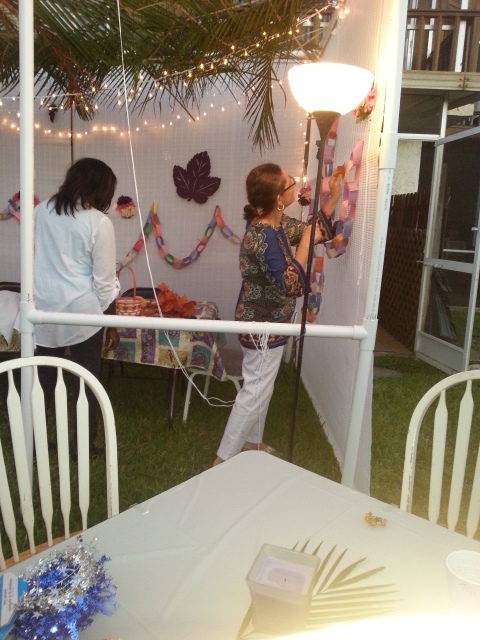 Great pictures of your beautiful Sukkah!!! 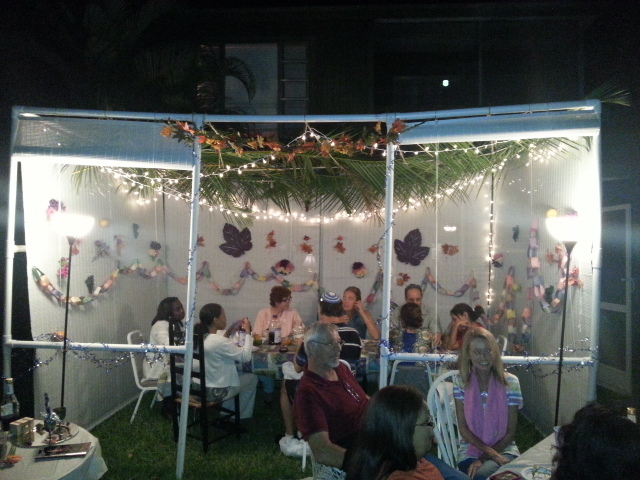 I think that your guests’ smiles were the best decorations in your Sukkah… do you agree? It is, by far, the best decoration there! I am still basking in the glow of the joy experienced this season. And today with Simcha Torah? No words. Did you build a sukkah again this year Alfredo? Hi Ro! We did have a Sukkah this year again, but the weather here in El Salvador didn’t help at all, so we had only guests one day. On the other hand, we were hosting one night at the Sukkah that was built at our congregation and we had such a wonderful time there! And, to top it all, this year was the first year that we celebrated Simcha Torah at our congregation! Our Father is wonderful. He has given us so much joy in our hearts for His Moedim (Feasts)!!! Alfredo! So glad to hear you had a sukkah again. 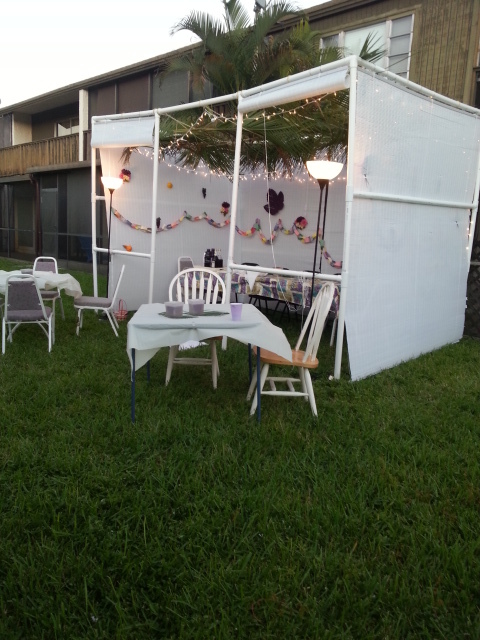 The photos you sent of last year’s sukkah were filled with joy. I’ll be posting about this year’s Simchat Torah, but I am really glad to hear about your celebration! I think the joy just keeps getting better and better. I agree with you, our Father IS wonderful and we are all so blessed to be included in His family!